Because there’s nothing as delicious as history -- and tacos, but also history -- Guinness has launched a “Signature Series” whose limited-edition beers will all be named after and informed by crucial dates from the 255-year-old brewery’s past. First up is the 9% ABV “Guinness: The 1759”, not at all coincidentally the year Arthur Guinness took out the 9,000 year old lease on St. James’s Gate in Dublin. The contents of the sleek black bottle reflect the beer Guinness was likely brewing that year, which means the contents aren’t the expected black, but amber, as stouts and dark porters wouldn’t be a thing for a few more decades. But after attempting to create a beer in the same vein as that long lost style, Guinness also decided to blend in some of Ireland’s most iconic peated whiskey malt to bring out the same mellow, caramel flavor that was such a huge part of what Arthur Guinness was known for. In keeping with the historic nature of the Signature Series, they partnered up with the venerable whiskey houses of the area, some of which have been distilling since the 1600s. Upon opening the bottle, there’s a slight carmel-y butterscotch aroma that carries into the malty taste of the beer, and there’s also a nice (decidedly non-IPA-like) bed of hoppiness, too. But what really hits you is that whiskey influence. It’s not as in your face as a barrel-aged ale, but there’s certainly a nice twist of dry, scotchy smokiness -- not too much though, because apparently overdoing that peat can give you something more akin to soy sauce than ale, and you’d have to be a kikkomaniac to want to drink an entire bottle of soy sauce. How does one get the stuff? The 90,000 bottles that are coming out this production are the only bottles that will ever be made. That might sound like a lot of bottles, but trust us, it is not a lot of bottles -- though on the plus side, all will be of the 750ml variety, so you’ll be able to spend a little more time getting intimate with yours if you’re on-the-spot enough to get one. 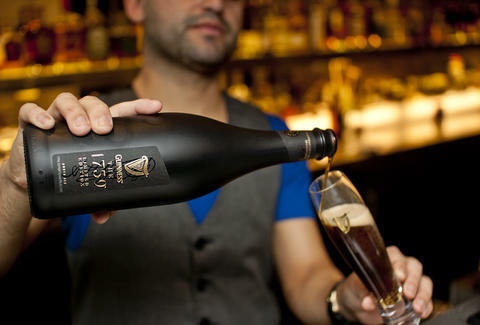 Speaking of which: check the Guinness site to find out where you can buy 1759 in stores. Alternatively, go here to buy yourself a couple bottles online -- hurry though, because unlike the brewery that’s older than freaking America, this beer will be gone quick. 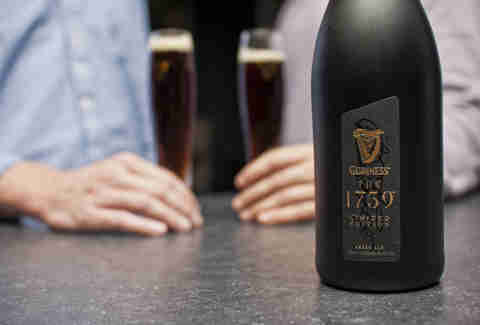 GUINNESS The 1759 Limited Edition Amber Ale. ©2014 Guinness & Co. 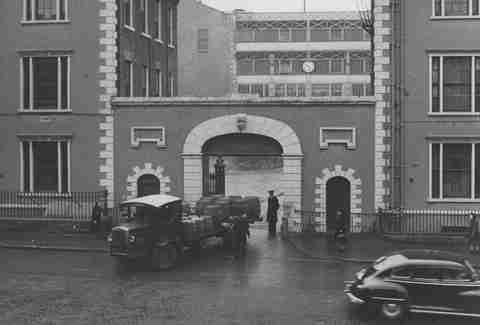 Imported by DIAGEO – Guinness USA, Norwalk, CT.